Click above to read the Attorneys of the Year 2017 digital edition. 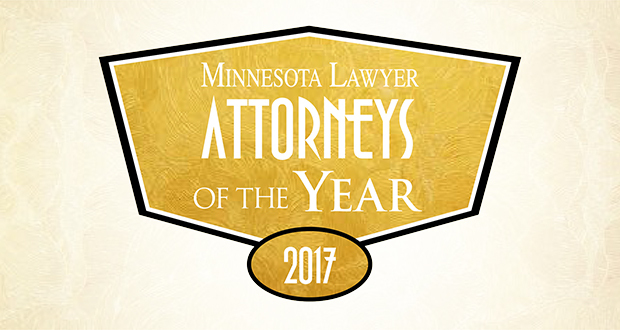 Each year, Minnesota Lawyer recognizes the best achievements in the Minnesota legal profession with the Attorneys of the Year awards. This year’s attorneys were chosen based on their leadership, involvement in major cases or other newsworthy events, excellence in corporate or transactional services, and public service. Once again, it is Minnesota Lawyer’s privilege to bring you the best of 2017 — the lawyers working in groups, partnerships or alone who put the grand in the canyon for our great profession. and owners of intellectual property. We saw lawyers putting themselves out there to help young lawyers find their way. Honorees selected two or more times have been inducted into the Circle of Excellence. Congratulations to all our 2017 Attorneys of the Year. Thank you to Kelsey and everyone at Minnesota Lawyer who made the 2017 Award Ceremony an event that made the award presentations a very special event. Shakespeare would have been pleased. There was just enough pomp and circumstance to generate (a modest amount of ) pride.